St John Bosco’s School is a Catholic Primary School committed to the promotion of the Catholic Faith. As followers of Jesus we look to work in partnership with families to nurture the students’ knowledge, understanding and faith in the Catholic tradition. The children commence their day with a prayer. They pray before having lunch and at the end of the day. Prayer is an integral part of whole school assembly. The children attend Mass as a whole school each Friday at 12:30pm. Each class is allocated a Friday where they will prepare a Mass based on the daily readings or a Mass that reflects their current Religious Education learning focus. A roster is drawn up at the beginning of each term and will be posted in each year level termly overview. The students in Year 6 are invited to participate in the Altar Server Program. Students learn what they need to do during Mass. A weekly roster is established to ensure each student has an opportunity to participate. Year 5 students are invited to participate in Term 4 in readiness for the following year. Family Masses occur once a month on a Saturday evening at 6pm. Each Class is allocated a month and date where they will organise the Mass readings and music. Families are invited to be part of this Eucharistic celebration which helps promote connections with our St John Bosco Parish. 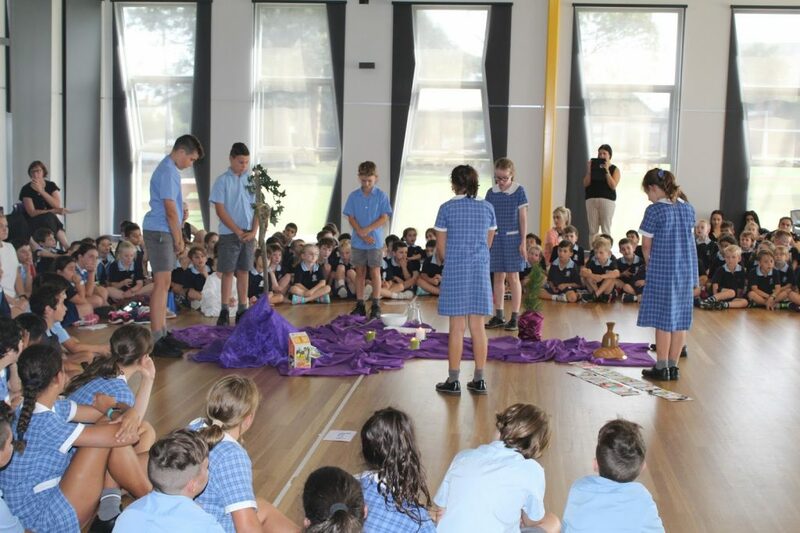 The children gather as a school community to share in a Paraliturgy that reflects on the key Catholic Liturgical Events of Easter and Advent. Parish Priest: In 2018 we await the appointment of a new Parish Priest to St john Bosco Parish and look forward to informing you when this occurs. Whilst we wait for this appointment we are under the administration of St Martin de Porres Parish whose Parish Priest is Fr. Nhan Le. Fr Nhan and Fr John O”Reilly will be conducting Masses for us. Please contact the Parish Secretary, Faye Colaco for further inquiries. Faye is available at the parish Tuesday to Friday: 9am to 4pm.